When I was a kid during social functions, it wasn't uncommon for the adults to make a break for the nearest TV to watch hockey. They would enthusiastically dissect the latest plays, predict how certain players would behave, and describe what losing teams should have done to come out on top. I'd watch it alongside them, but it never resonated with me. I'd much rather have changed the channel to start up a game console, or left the room to play a PC title. Twenty years later, I'm sitting in the auditorium for World of Tanks' 2016 Grand Finals, where Hellraisers and Navi are going head-to-head in spectacular displays of combat and skill. Fans are cheering all around me, so loudly that at one point it distracts the commentators analyzing each play. But what strikes me is that everyone screaming aren't simply sports fans: They're also gamers, likely dedicating hours of each day to World of Tanks. Some have probably met these finalists during online matches. For my entire childhood, sports and gaming were considered two different things, but here gamers leap from their seats with every tank volley, shouting for joy just like hockey fans would react to a puck hitting net. And I'm getting swept along with them. Victor Kislyi is no stranger to this dynamic. 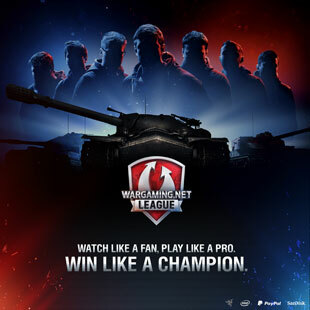 As Wargaming's CEO and a lifelong gamer, he's watched fans embrace World of Tanks to a degree that transformed this historical-MMO into a literal stadium event. "For many people it's not just a game," he tells me at the finals. "It's already much more, it's kind of a lifestyle. So you wake up, and you think about World of Tanks [matches] ... or how to bring your friends together for some competition between yourselves. Or maybe join something like this." According to Kislyi, it was this drive that pushed World of Tanks into the realm of spectator sports. In fact, it was only after the game developed interest among streaming communities that Wargaming developed Tanks as an official eSport. "It was not even us," he explains. "It was players who would organize themselves in unofficial clans through artificial elements [to] create their own tournaments. There was a grassroots triumph. And we did not lose too much time, we just realized 'Okay, this can be eSports', and just started making it." By just about every metric you can measure from, World of Tanks is certainly a massive gaming success story. Millions of players take part in matches, and it holds a Guinness World Record for the largest number of simultaneous players on a single server. On the eSports front alone, World of Tanks is seeing impressive growth, with a streaming audience that grows each year. Yet even with these successes, Kislyi notes there are many ways Wargaming could improve World of Tanks eSports viability, and the core game itself. "ESports in general is very young and World of Tanks is ... on our third year [as an eSport]," Kislyi notes. "So we cannot say everything is perfect. There is still lots of improvement to make on the production value, on the spectator mode elements, but we're getting there." It's a strange comment when considering a company which grew from humble origins to become a major Triple A MMO publisher, but Kislyi considers it important - the video game industry is constantly changing, and anyone failing to address player needs will quickly fall behind. "I play a lot of Wargaming games. And I'll also play Master of Orion, when it's officially released." For that reason, Wargaming is constantly testing the waters with new gaming initiatives and experiments, some of which debuted during the Grand Finals. On the eSports front, World of Warships saw its first professional streamed matches over the weekend, an ideal opportunity to see if audiences will embrace another Wargaming MMO. The event also featured a VR station where players could immerse themselves in a World of Tanks spectator experience, which is timely given the Oculus Rift's recent release. "[Virtual reality] is a very very hot topic and obviously Facebook knows what they're doing," Kislyi says. "As it stands up right now the device is too bulky, too expensive, too impractical for long-time users, but I believe in mankind and technological progress." He points to a phone I'd set on the table when the interview began. "We did not have these things ten years ago, these functionalities, these capacities ... They will get there. This way or that way." 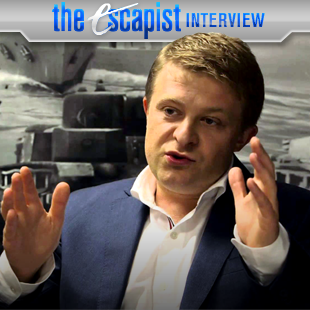 For now, Kislyi believes VR has a limited role for Wargaming titles. Even if the Oculus Rift is completely successful, its high price doesn't reflect World of Tanks free-to-play environment. Where Kislyi sees potential is in creating virtual reality spectator environments, visiting digital "museums", streaming spectator sports through VR, or watching World War II reenactments produced by World of Tanks . "I truly believe that VR will be pushed by travel applications like visiting Grand Canyon, visiting museums, this kind of educational travel," he predicts. "Gaming will catch up very soon." Experiments with VR aside, gaming remains Kislyi's primary focus, and not just as the CEO of Wargaming. He's absolutely a gamer himself, one who started the company two decades ago with others wanting to make an impression on the industry. What's more, he still plays extensively today. "Oh my god, all my free time I play," he says. "I play World of Tanks PC. I play World of Tanks [console] with my son, this is our father-son kind of thing. And I play World of Warships. I play a lot of Wargaming games. And I'll also play Master of Orion, when it's officially released." Despite all his play time, Kislyi admits he wouldn't stand a chance against the finalists playing on the nearby stage. "We [once] did a couple of short matches with a Japanese eSports team. There was no chance. Just no chance." With that mindset, it's easy to imagine how excited Kislyi is for the upcoming Master of Orion revival - both on a professional and personal level. "In our case Atari was fire selling an auction ... We don't schedule this auction so we had to go and get Master of Orion. It was very expensive. After that the forums for a couple of days were all like 'Wargaming don't even think about making an MMO of Master of Orion. Give us back what we liked'. And we did not want to make MMO out of that. I said we'll bring back the legend as I knew it. The spirit, and the style, and the gameplay turn-based strategy is all there, we just give it a 2016 look and feel. With models, with hundreds of dialogue lines, with probably one of the coolest voice over staff headed by Luke Skywalker. "My son will play this. I don't believe my son will ever look on 1996 version of Master of Orion, but this one he will obviously play. So you, me, all the guys who played it before, will hopefully jump on it ... but there's a generation or two of gamers who were not born at the time and will have a chance to try it with Triple A production values. We're bringing back the legend." One thing seems clear: Whether it's through Master of Orion, World of Warships, or even more World of Tanks tournaments, Wargaming hopes to promote that gaming lifestyle for years to come. Master of Orion is currently available on Early Access, while World of Tanks and World of Warships are available from their respective websites. Marshall Lemon is a freelance writer and editor with a fondness for the Cleveland Cruiser. You can follow him on Twitter. This interview was conducted at the World of Tanks 2016 Grand Finals in Warsaw, Poland. All travel and hotel expenses were covered by Wargaming.